I went with my boss and his wife and some company to Cagayan de Oro last Sunday. 3 of them are delegates to the meeting while the two of us (me and the boss wife) have the time to ourselves to go around. The other one is the driver. Some of us didn’t have breakfast so 4 of us went out to find a diner. We looked for an “eat all you can” buffet and yeah we found one. We had breakfast at Sunburst (will make another post about this place) and we were all full! Even though i was full but i was looking forward to go out of the restaurant so that i could sky watch. So this is one of the shots! 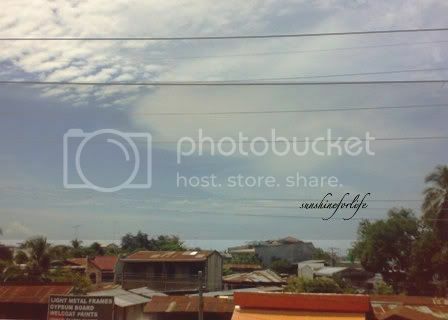 Some of the sky shots i took on our way back from the burial of another family friend in Initao, Misamis Oriental. I just got back a lil bit past 12 am. I took this photo 2 Sundays ago when i went out with my daughter to the mall for malling. Since we just went around, we tour the whole place. And this is the view from the 2nd floor. The sky was blue that day so it was very hot. After taking this photo we have to run inside for the shade.